(18/P032) TRENTON – The Department of Environmental Protection’s Division of Parks and Forestry today celebrated the 125th anniversary of the nation’s first official reciting of the Pledge of Allegiance by unveiling new museum exhibits at the Twin Lights of the Navesink Historic Site in Highlands, Monmouth County. The brownstone structure sits atop headlands overlooking the ocean and the mouth of the Navesink River. Funded by donations to the Twin Lights Historical Society, the new exhibits – many complemented by new videos – are themed to the Pledge of Allegiance, local history, maritime history, lifesaving and lighthouse technologies. 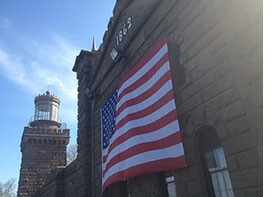 “The April 25 date is significant as, on this date 125 years ago, in 1893, the Pledge of Allegiance was delivered as America’s national oath of loyalty for the first time,” said Twin Lights Historical Society President Tom Mullins. The first official reading of the Pledge of Allegiance took place during a ceremony around a 135-foot-high flag pole at Twin Lights known as the Liberty Pole – among the first sights millions of immigrants saw as they steamed toward Ellis Island and new lives in America. The first official recitation was led by its author, Francis Bellamy, who wrote the Pledge of Allegiance for schoolchildren to recite during a Columbus Day ceremony in 1892. The installation of the new exhibits follows a successful two-year run of “Seeing Stars,” a special exhibition spotlighting the history of the American flag. Twin Lights – commanding a sweeping view of Sandy Hook, Raritan Bay and the ocean – was completed in 1862 to guide ships into New York Harbor. Replacing earlier light stations, it was considered the best and brightest lighthouse in North America for generations of seafarers. The castle-like structure is noted for its unique construction featuring light towers on either end of a long main building that today houses the museum. In 1898, electric lamps were placed in the south tower, making this one of the first electrically powered lighthouses in the nation. The lighthouse tower, museum, gift shop, and other buildings are open Wednesday through Sunday, 10 a.m. to 4 p.m. The grounds are generally open 9 a.m. to 4:30 p.m. but times may vary. Please call (732) 872-1814 for current information on hours of operation. Admission to the grounds, museum and lighthouse is free.